Those that know me know I L O V E a good mood board! The scheme on paper, before it is implemented, perfect in the designers mind where as in reality it is just the starting point. Why.....I hear you all saying! What is it that is so important about a Mood Board? I find when designing a scheme that clients are better at saying no to something in a design even more so after thinking about it after a few days. Pin pointing what they like is the tricky bit! As a professional we are qualified to know how to design and how to put a scheme together. By doing this on a mood board the client has something to take home. Look at in the space. See it in all times of the day. Show friends, family, children. Obtain the full approval! That way they are completely part of the process. I know the "turn-key" approach is the current in thing but how can you do that with someones home? How can a client love it without any input?! A mood board starts off the journey. I listen, research and plan the space. I then put together ideas of how I visualise the space and let the clients take it home. Then the fun stuff starts when we go back to the drawing board and put together final designs. It's a good job I love mood boards (you will see over the months how neat they have to be - I am a neat freak) as I can sometimes do three for just one room. 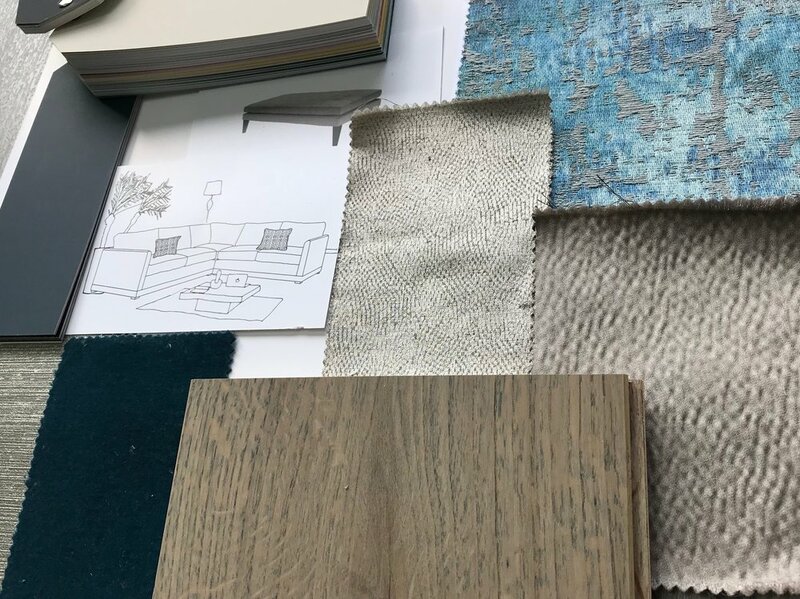 A mood board starts with colours, textures, fabrics (me diving head first in to a massive box of samples) and then follows with furniture, paintings, accessories. The first part is always with actual samples, then I move on to the computer and the final board is a mixture of everything. Below are a few images of how they start. You will have to wait for MOOD BOARD MONDAY to see the finished article! Should you wish to transform a room in your home and receive your own personal Mood Board then please give us a ring and see how we can help you. Putting fabrics, colours and textures together. Looking at just the soft elements to the scheme. 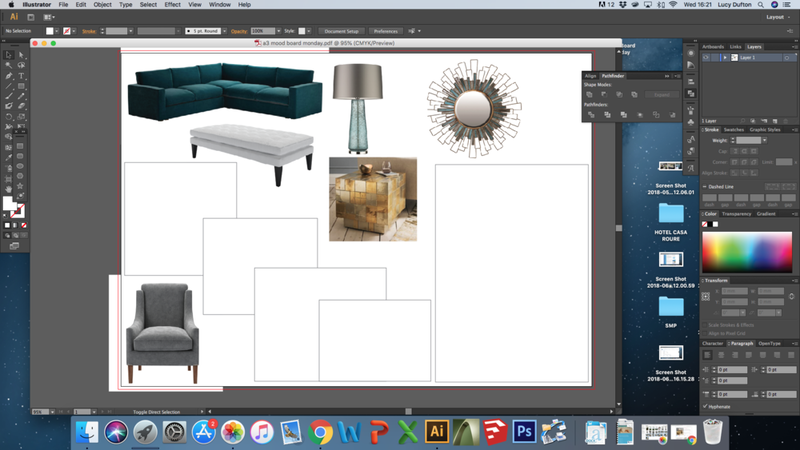 Designing the layout of the mood board using Illustrator. The blank boxes will be where the actual samples will be mounted.